Two independent teams of researchers discovered these oddities when combing through data taken by the now-retired Helios solar probes, a collaboration between NASA and the German Aerospace Center, and NASA’s Solar Dynamics Observatory. The probes were launched in the mid-1970s and died about a decade later, but left behind a mass of data. Temperatures on the Sun’s corona can skyrocket to millions of degrees Celsius. The region of plasma makes up the outer layers of the Sun’s atmosphere, and is where a team of researchers led by Simone Di Matteo, a space physics PhD student at the University of L’Aquila, Italy, found pools of charged particles congealed into giant blobs. They’re filled with highly energetic electrons, protons, and alpha particles and the bubbles can balloon to the size of anywhere from 50 to 500 times the size of Earth, before they are carried off into space as solar wind. These bubbles are blown to create trails of blobs, ejected every 90 minutes or so, like some solar lava lamp. Despite their large sizes, the plasma bubbles have been surprisingly difficult to find. As the solar wind pushes these bubbles, they float across vast distances in the Solar System and the temperature and density of particles fade away. Luckily, evidence for them was captured in data taken by the Helios probes. Scientists have observed these blobs from Earth before, but haven’t previously studied their formation so close to the Sun. The results, published in JGR Space Physics, show that these patches are hotter and denser than the normal level of solar wind. NASA hopes to study these bubbles with its Solar Parker Probe, launched last year. “This is one of those studies that brought up more questions than we answered, but that’s perfect for Parker Solar Probe,” said Nicholeen Viall, a solar scientist at NASA. In another paper also studying the corona, a separate team of researchers from NASA and the Catholic University of America analyzed how rain fell on the Sun, though not the rain we're used to. Coronal rain shares some similarity with rain on Earth, but instead of liquid water it consists of streaks of hot plasma. 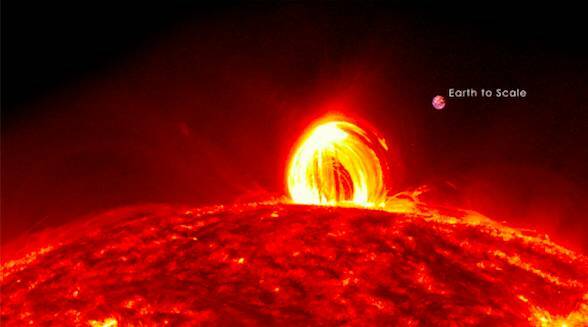 The plasma is heated by the Sun’s energy and pushed to the solar surface. The particles are guided by the magnetic field lines and trace loop-like patterns, where they break out from the Sun’s surface and come crashing back down in circles, creating what’s known as coronal rain. A visualisation of coronal rain. Image taken from a GIF created by NASA’s Solar Dynamics Observatory/Scientific Visualization Studio/Tom Bridgman, Lead Animator. The data taken from the Solar Dynamics Observatory, tracing the motion of the plasma, may explain why the corona is hotter than the Sun’s surface. The plasma is heated from a few thousand degrees Celsius to nearly a million degrees Celsius as it travels across the loop. As it cools, the particles condense and gravity pulls it back down towards the Sun. “If a loop has coronal rain on it, that means that the bottom 10 percent of it, or less, is where coronal heating is happening,” said Emily Mason, first author of the paper published in The Astrophysical Journal and a graduate student at The Catholic University of America.